Let’s be honest—the title of this post probably caused most of us to shudder just a little. If your school-days memories of grammar didn’t elicit a negative response, then the impossible-to-attain image of the perfect woman probably did. Let me put your mind at ease. Today’s lesson in grammar will be painless, and the characteristics we’re going to consider in the Proverbs 31 woman are totally within our grasp. No need for shuddering today. You know what I realized? I don’t have to sew bed coverings or buy a field or sell linen garments to be a woman “worth far more than rubies.” (v. 10) I can apply the basic verbs of this stellar woman and be the woman God wants me to be. *She brings (v.12, 14) – what do we bring to our husbands, our children, our world? Let’s bring positive things like respect, encouragement, and support. *She selects (v. 13) – what do we choose to invest our time and energy in? Do we use wisdom in making choices for ourselves and our families? Let’s select the best. *She works (v. 13) – whether in the home or outside the home, do our family, friends, and coworkers see a woman willing to work diligently? Let’s bring glory to God through our work ethic. *She considers (v. 16) – how do we make our judgments and decisions? Do we think through issues carefully and look at all sides before giving an opinion or moving forward with a plan? Let’s use common sense, seek advice, and be careful. 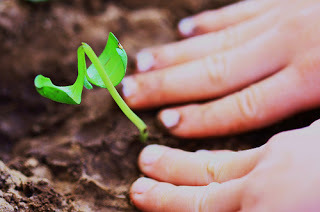 *She plants (v. 16) – what truths, qualities, and examples are we planting in our children and in others in our lives? Let’s plant the Word of God and the principles found therein. Let’s plant love, joy, peace, compassion, understanding, kindness, and a host of other godly qualities. *She opens (v. 20) – do we pave the way for loved ones to grow or heal and make it possible for others to be blessed? Let’s be a positive influence wherever we are. This is not an exhaustive list—but it’s enough to get us started considering the verbs of the Proverbs 31 woman. It’s enough to help us realize that the actions—the verbs—of this much-admired woman are indeed possible for us to live out in our own lives. So no shuddering needed after all. Let’s apply the verbs of this stellar woman and be the women God wants us to be! *Other verbs mentioned are provides, sees, holds, grasps, extends, makes, supplies, laughs, speaks, and watches. From these and the ones listed above, what are your areas of strength? What areas do you need to develop more? *Life Notes, my quarterly inspirational newsletter, came out May 1st. It’s not too late to receive. Sign up is free and to the right! *Don’t forget to come over and “like” my new Cheryl Barker, Writer page on Facebook. I think you’ll enjoy it! I love this scripture and you made this post so enjoyable to read. You have such an awesome way of explaining things. Hope you had a wonderful Mothers Day!! Cheryl, this was lovely. And it gave me lots of food for thought. “She thinks.” Is that one of them? No? Well how about considers? Actually, I think this might be more of a weakness for me than a strength. I need to learn to consider more. Just think, Cheryl, she did it all without a smart phone! What a wonderful post! As a former English teacher, I love the grammatical concept you’ve elucidated. Wonderful and thought provoking. She works and laughs are probably my strongest points. The verb I need to consider and develop is definitely “plants.” I know I have an opportunity to “plant” more positive things in my loved ones than I do now. Ladies, thanks so much for your wonderful comments. Each one touches on something a little different. You all are such an encouragement to me. Alicia, yes, I had a great Mother’s Day. I got to attend church at my youngest daughter’s church for the first time. Such a blessing. Jeneal and Sue, thanks so much for sharing the areas you need some work in. God bless as you strive to consider and plant! This is such an incredible way to look at this passage. You should do a more indepth look at this passage with the ideas you present here. Love it! Thanks, Kristin! So glad you enjoyed the post, and I appreciate your encouragement to do even more with it. I’d already thought that it would be a good piece to submit somewhere if I worked on it a bit more. Thanks for the feedback! Excellent insight, not intimidating but inspiring. Great post! love this post. i love it. i really love it. Thanks, Sarah! Glad it hit the spot for you! Meta Jo, you’re welcome — so glad you found it helpful! And thanks for visiting my website and adding your thoughts here. Much appreciated!